I'll be right up front—I don't "do" camping. But it's not for lack of trying. We had a camper when I was a kid and we stayed in every KOA campground on the east coast, all the way up to Nova Scotia. But whenever it came time to have our meals at a picnic table, I'd opt to sit in our pop-top VW to eat. After all, a bug might drop out of a tree and onto my sandwich. And I wasn't willing to hazard that kind of risk. And camping is just so....uncomfortable. So when my partner, a true nature-lover, suggested we go tent camping 10 years ago, I figured I'd give it the ol' college try. She set up the entire site—built a fire, pitched the tent—while I swatted flies. I did, however, bring matching dinner plates and napkins. When it was time to turn in for the night, I took one look at her miniscule dome tent—not big enough to cover an ant hill—and thought I might hyperventilate. But I never let on how much I was suffering. 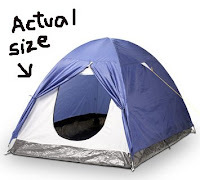 The next time she suggested we go camping, I offered to buy a new tent. Okay, she said. So I bought a 3-room tent, complete with parlor and ballroom. It was sweet. She was not happy, though, as it took a long time to set up. A few years ago, we planned a trip to the mountains of North Carolina. Hey, I said, instead of camping, how 'bout I spring for a cabin for us. Sure, she said. So I made reservations at a lovely log cabin complete with vaulted ceiling, jacuzzi, and bidet. 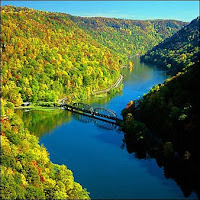 Next week, we're attending her family reunion at Lake Sherwood in Wild & Wonderful West Virginia. Her family will pitch tents, cook over campfires, and sleep on the gr ound. And we'll be staying at a nearby hotel. This camping thing just gets better and better! So what's all this have to do with woodworking? Well, I'm taking along my carving knives and will attempt to make a kuksa, while sitting on a log, fireside. At least maybe I'll give the impression that I'm an outdoorsy gal. You not only brought back memories of a twenty five year 'career' with VW back in the air cooled days, but some great camping memories. I don't know whether you read my blog or not, but when I get time, I'll put up a special post just for you, about the disco campers we stayed next to one time. It was awesome, sort of. Silverback, please shoot me an email when you put up your blog post about the disco campers. I don't want to miss it! I have never been much of a camper myself, possibly because I am a mosquito magnet! Don't go "camping" and pull out some itsy bitsy (wimpy) carving knife... Instead walk around camp with a double bit axe and a machete and tell everyone you see you're heading into the forest and you will be dragging a tree back to camp later in the day. 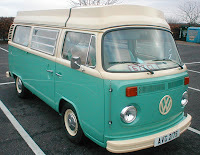 WoodShepherd, I might have enjoyed camping more if we had had the Partridge Family's bus! Bill, now there's a vision! Kari, your campground greed will soar when you whip out the carving knives and transform a hunk of green wood into a drinking cup (kuksa). Bring some whiskey to share in the finished kuksa and you'll become infamous! Camping is God's way of telling you that you have way too much time on your hands. We leave for my summer show on Martha's Vineyard next week and the spoon carving bag is packed. Too hot to knit in the summer and you and PF got me playing with knives again...on brief time outs from painting...and I have used an earlier posting of yours to link me up to some great old spoon carvings which I want to replicate. More fun than a person should have ! Will, that's a great idea! Heather, have a great time carving spoons while at your show. What an excellent way to pass the time!